Air covered yarns (ACY) are produced by combining one or more draw textured filament yarns together with an elastomer yarn like spandex. Both types of yarn run through an intermingling jet, where air pressure will be applied to create interlacing zones. The filament yarns is overfed, entering the jet in a relaxed form, allowing the formation of intermingled points. The elastomer yarn will be stretched to a specific draw-ratio, to create the required elasticity in the final application. Compared to the conventional covering (CCY) process, the air covering process excels in much higher productivity, especially for fine counts, since the DTY and Elastane are intermingled and not twisted together, eliminating the requirements of high need of high rotation speeds, which is limiting factor of the CCY process. 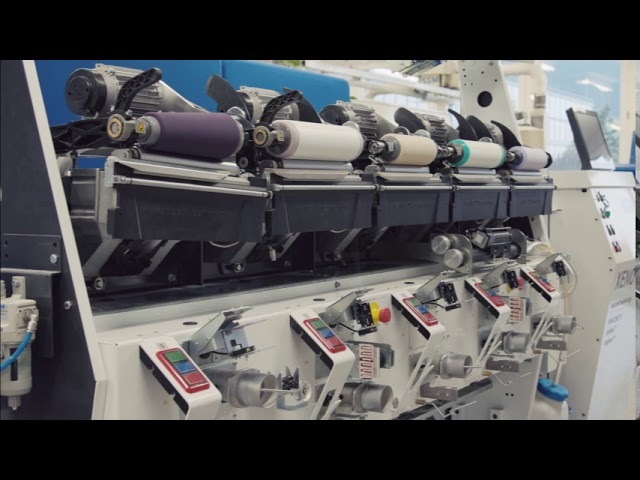 XENO-AC – the new SSM air covering machine – is a yarn processing machine for intermingling and precision winding of filament yarns and Elastan with or without lubrication. Infinitely adjustable process conditions as well as an up-todate yarn path enable the optimisation of the closeness and stability of the intermingling of yarns, according to the specific requirements of the downstream process.